The Bill and Melinda Gates Foundation, launched in 2000, is the one of the largest private foundations in the world. They are focused on globally enhancing healthcare, reducing extreme poverty and expanding educational opportunities in the US. This foundation seems destined and designed to focus on making a big Impact that will leave a lasting legacy. A strong sense of Impact and Meaning is the fuel for everyone on their team to jump out of bed every morning and row in the same direction. Success has been realized by executing a great strategy where impact and meaning are the central themes day in and day out. This has resulted in raising over ~$42B that can be used to help the world fight these issues. The Gates Foundation is a nice example that drives home the concept of what I will call the 3 step guide within a strategy (Meaning, Impact, Execution). The position statement does this by showing how each drives value, and is best maximized when used in an integrated manner. For example; Strategy with Meaning and Execution with Impact (rather than driving these in silos across organizations) produces a profound result. Having one without the other is possible, but when working together, the possibilities are limitless. We see this all around us. For example, DOVE executed (what is now) a legendary campaign. Dove introduced Meaning into their Strategy and tranformed their market position. In today’s business climate, failure occurs in organizations that miss the opportunity to bring these four circles together by driving meaning to their employees and customers in a way that will greatly impact their business and society as a whole. Meaning: Regardless of industry, strategy planning can fall into an “in the now” approach. On the opposite side, it is common to find a focus on futuristic views and next generation themes. However, this is a “static” strategy approach. The “static” strategy approach is not “dynamic”. It is like a photograph – The minute you snap that photo, it is a piece of history. With that said, a company cannot shift a strategy daily (unless you are early stage potentially) – However, the fact is that the market place gradually shifts everyday – So, the idea is to anticipate these shifts and drive a strategy that is tied to where capabilities meet the market needs of tomorrow leveraging the resources one has today. This is also where the intersection of strategy and meaning will reveal themsleves in a way that empowers a stronger company culture. Strategy and marketing department ideaologies converge to define the brand at this point. This is a shift that will be felt across all parts of the organization. How? The signals are typically present in multiple sources such as customers, partners, competitors, and high potential “thinkers” inside your own organization. KEY POINT: The strategy that will define the future cannot be constructed sitting behind the desk. Walk the floors with your customers, partners, and high potential employees. This is paramount. Craft the strategy with open windows that lead to driving meaning into your brand. Impact: Impact is a cultural “to-do” that must be a system of measurement. To clarify; it is optimal to measure your strategy impact. Much like the Gates Foundation example, to create Meaning and build a legacy, Impact must be an action AND a result. Impact is typically something that is a story that is easily told, resonates with many and is very authentic. 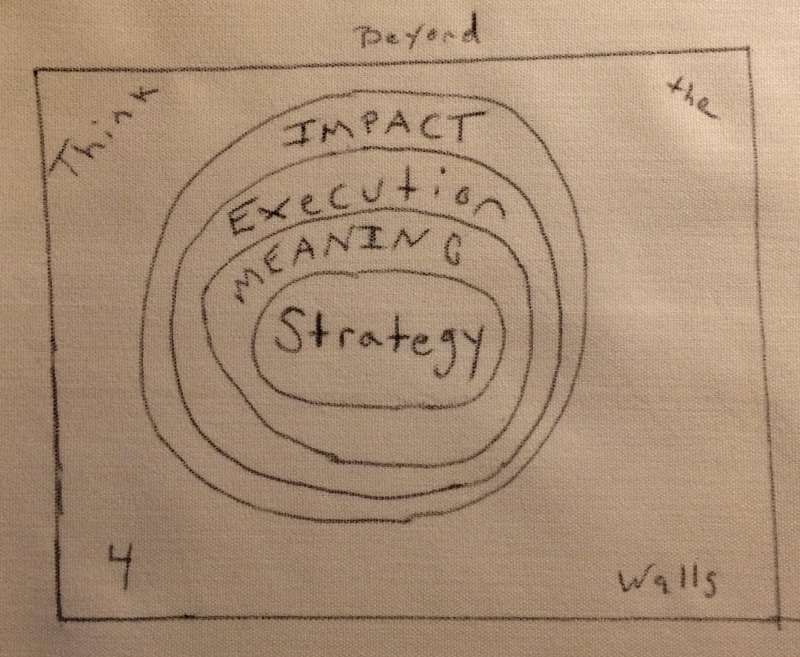 Impact differs from Execution – Impact is the result of successful Execution. Execution: Take the case in point at Cleveland Clinic. Cleveland Clinic was interested in raising customer satisfaction (several years ago). Internally, a campaign was created for employees to adopt this sense of empathy at a deeper level, not just for patients but colleagues as well. 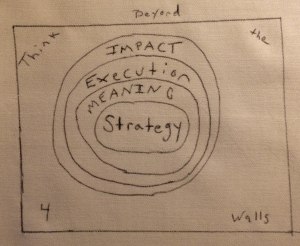 This is Impact as a byproduct of successful Strategy executed. In Summary: An integrated approach to connecting Strategy to Meaning (while having Execution drive Impact) is a great way of breaking down silos in any organization. This forces teams to talk, and best of all, think more broadly. Without executive support however, we fall back into doing things the old way and pleasing our internal stakeholders rather than our customers. As we have seen with the examples in this case, it is essential to look beyond the 4 walls of your current organization to transcend traditional ways of thinking in order to gain a competitive advantage by connecting these 3 guiding principles.